FixxGlove™ Orthoses with Volar stay for three or five fingers. Comfortable night orthoses designed for post-surgical management of Dupuytren’s contracture. Available in a Volar/Palmar model three or five fingers (see bottom of this page). FixxGlove orthosis is a static extension night orthosis/splint that is easy to put on and comfortable to wear. It has a built-in malleable/adjustable aluminum stay, as well as finger straps for easy removal. The comfortable design may increase patient compliance in long term treatment scenarios following Dupuytren's release surgery. The different models of the FixxGlove Orthosis provide users the option to choose between three or five finger volar/palmar support. Thus allowing for a choice of Dupuytren Splint based on personal preference and comfort. Medical literature proposes/suggests that a static extension orthosis/splint be worn at night for up to 6 months and sometimes longer, following surgical procedures such as Percutaneous Needle Fasciotomies (Percutaneous Needle Aponeurotomy) and Collagenase Clostridium Histolyticum injections as well as Fascioectomies. The FixxGlove orthosis is washable in temperatures below 90 degrees Fahrenheit. Remove stay before washing. Please note that the FixxGlove orthosis should not be worn without it being recommended by a medical professional. Please make sure that a professional made the required measurements to insure a proper fit. Only wear the FixxGloves orthosis after wounds are healed. Recently published case studies suggests that splinting of the Dupuytren finger, wether following Dupuytren's release surgery or still untreated, provide new therapeutic options. 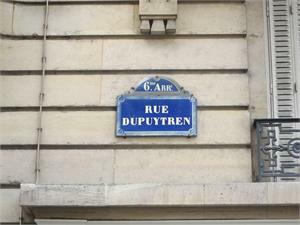 Rue Dupuytren in Paris. Named after Dr. Dupuytren, the French Physician credited with first describing this medical condition..
Albrecht Mainel, The role of Static Night Splinting After Contracture Release for Dupuytren Disease: A Preliminary Recommendation Based on Clinical Cases, C. Eaton et al. (eds.) Dupuytren's Disease and Related Hyperproliferative Disorders. DOI 10.1007/978-3-642-22697-7_42, Springer-Verlag Berlin Heidelberg 2012. Albrecht Meinel: The palmar fibromatosis or the loss of flexibility of the palmar finger tissue. New insight into the disease process of Dupuytren's contracture based on clinical and anatomical findings. Presented at the conference on Dupuytren's Disease in Miami, USA, 22/23 May 2010. Larocerie-Salgado J, Davidson J., Hotel Dieu Hospital, Kingston, Ontario, Canada.“Nonoperative treatment of PIPJ flexion contractures associated with Dupuytren's Disease.” J Hand Surg Eur Vol. 2011 Sep 30.